The last snow of the season! In the Lofoten Islands and the region of Narvik in the north of Norway, the scenery can only be described as magnificent. The cold and calm waters of the fjords meet the snowy mountains, and the Nordic Sea flows through the land like lace. 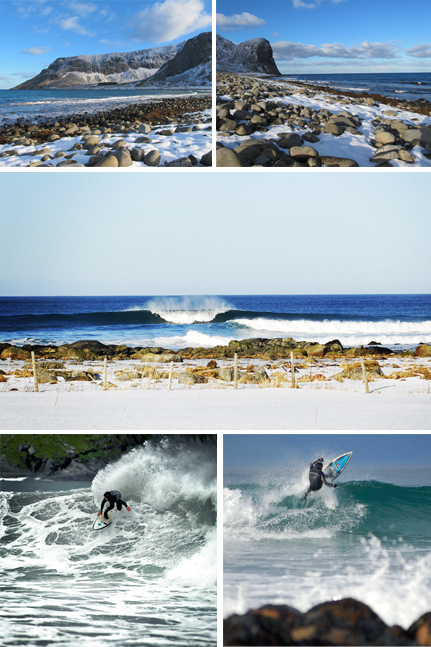 In this great north, close to the Arctic Circle, one can engage, summer or winter, in some incredible albeit unconventional outdoor pursuits. 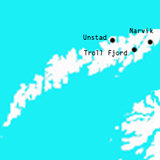 Activities on offer include, amongst other things: encountering wild animals native to this region in their natural habitat; going out to sea to fish for cod – the main export that has long since represented the primary economic resource of the country; skiing and watching the boats below come and go in the fjords; surfing in the waters unleashed from the Norwegian Sea in one of the most sought after spots for nature surfers. And here you have just a small taste of the incredible and unique “walk” we are taking you on this week. Resources: the country’s very abundant stores of gas and oil have taken over cod as Norway’s primary economic resources. The town of Narvik, 300 km from the Arctic Circle, is the main town of this mountainous region of northern Norway. It is known by historians to have been the site of a great naval battle between the Germans and the Allies in 1940. But today it simply provides an unexpected, sensational day of skiing for those who visit Narvik. 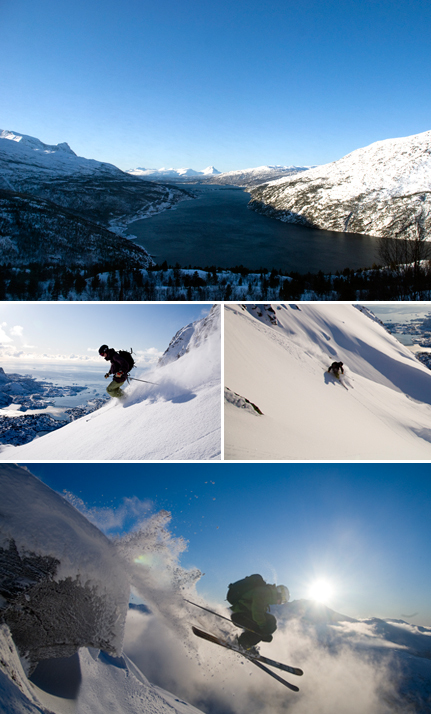 The slopes are accessible from the city center, and they overlook the deep and calm waters of the beautiful fjords. Sliding down a snowy hill while watching these huge bodies of water is a simple pleasure even the most jaded of skiers would appreciate. Narvik is one of the very few places in Europe where you can enjoy a panorama of such vast expanses of water like this. Once you have rolled down the 16 pistes of Narvik, we recommend you take the little train that crosses the countryside and drive, for forty minutes, to Riksgrensen. Here, we are in Sweden and a fully skiable area which is much larger than Narvik. An ideal combination to provide both the skiing experience overlooking the fjords, capped off with a day in a high mountain area with some enjoyable but challenging runs. 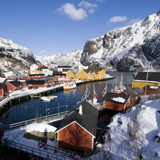 Svolaer is a charming little fishing village in Lofoten. The ideal starting point for a day at sea on a real fishing boat to head towards the Troll Fjord, one of the most beautiful fjords in the region. When one enters the narrow pass that leads to a kind of small lake, overlooked by high mountains over 800 meters tall, a shiver runs up the spine…But soon, it is time to get involved in the action. The waters of the fjords are incredibly abundant in fish. So much so that it is almost impossible not to catch some beautiful hungry cod when one casts a line into the cold water. Fishing is accessible to all. Those who have no interest can always feed the wild eagles that inhabit these parts instead, who come to pick at the fish that stir under their beaks. 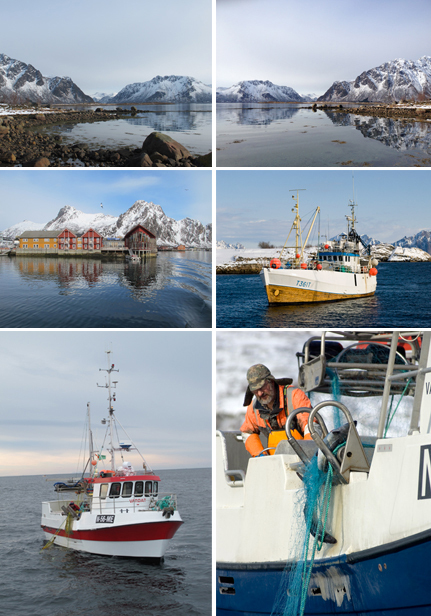 The village of Svolaer is very traditional and full of good restaurants that serve ultra fresh fish. The Anker Brygge Hotel has small fishing cottages available to rent that are very comfortable and its restaurant is known to be one of the best. There were those who danced with wolves. Now, there are those who kiss wolves! The Polar Park near Narvik, in the north of Norway, is home to the king of the animals of the great north in a natural protected area. In the park there are even a few wolves that can be approached in their natural habitat, making for some very moving encounters. Luna and Ulva, the two females and Steinulv, the male of the pack, have been amongst humans since birth. And even if they live the majority of the time alone in their territory, they are very affectionate towards their visitors. It is therefore common for them to approach and welcome you “wolf style”, by licking you on the face and mouth! Being in such close proximity to these predators in their wild habitat is undoubtedly an unforgettable experience. But the Polar Park also allows guests to approach bears, lynx, as well as fluffy snow foxes and other playful creatures that can be fed by hand and that will run between your legs. The Polar Park is very respectful of the well being of its guests and is also the most northern zoo in all of Europe. 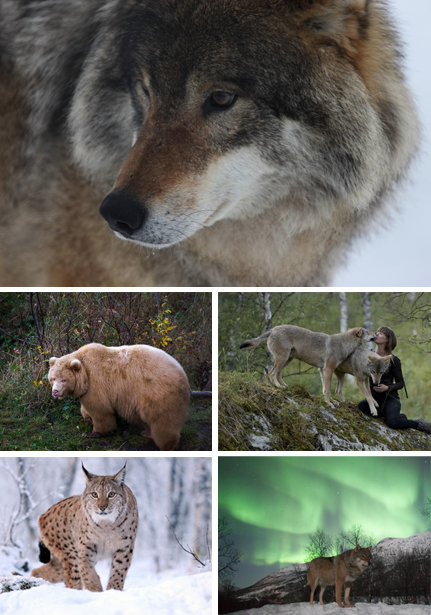 A little hidden gem in the heart of nature, only a few hundred kilometers from the Arctic Circle that offers a unique encounter with animals that normally can’t be approached.